The Porchlight Sessions DVD is now available from the International Bluegrass Music Museum. The Porchlight Sessions is a documentary on the bluegrass movement, as recollected by historical patriarchs of the movement including Dr. Ralph Stanley and Doc Watson, then follows through to modern-day musicians including Sam Bush, Jerry Douglas, Béla Fleck, Steve Martin, Del McCoury, Bobby Osborne, Trampled By Turtles, Mumford & Sons, The Infamous Stringdusters and many more. Bluegrass music emerged from the crossroads of the Appalachian Mountains, where Jazz and Blues merged with Scots-Irish folk music. The movement as it began with Bill Monroe was inspired and sustained by a diversity of voices, attitudes, and approaches contributing to the progression of modern-day bluegrass. The Porchlight Sessions Teaser from Pineview Pictures on Vimeo. Bluegrass Museum Hires Bluegrass Ace, Danny Clark as Membership and Special Events Manager . The International Bluegrass Music Museum (IBMM), home of the Bluegrass Music Hall of Fame, announced that Danny Clark has been hired as the Membership and Special Events Manager. This role was created to grow membership, foster engagement from the bluegrass community, and develop special events at the Museum. We are glad to welcome Danny Clark to the International Bluegrass Music Museum. Few people possess his level of knowledge about bluegrass, and his passion for the music is very refreshing. As an added bonus, Danny is a great musician and has been part of this wonderful community of bluegrass music for a long time. As we work toward transitioning to our new location in 2018, Danny Clark is a great addition to the team – Chris Joslin, Executive Director. A 2010 graduate of Middle Tennessee State University’s Music Industry program, Clark is no stranger to the IBMM, having worked as the Marketing Director in 2011 through March of 2013. Clark is an accomplished musician, a former board member of the International Bluegrass Music Association (IBMA), and a recipient of the 2013 IBMA Industry New Professional Momentum Award. I am honoured to be joining the team at the bluegrass museum. I look forward to building and strengthening ties to bluegrass culture and community while working in the role of Membership and Special Events Manager – Danny Clark. Clark joins the IBMM staff at a pivotal time, as construction is currently under way on the new $15.3M facility in downtown Owensboro. The newly created role will utilise the new space and unique capabilities in order to develop events that will attract people to the museum from around the world. Danny’s creativity and innovation will certainly create a lot of opportunity for people to engage with the International Bluegrass Music Museum regardless of where they live. Music is at the centre of everything we do. The music itself is the energy source that brings the IBMM to life. As the Membership and Special Events Manager, Danny will be able to leverage the authenticity and power of this great music to bring people together here at the museum – Chris Joslin, Executive Director. The International Bluegrass Music Museum is a 501c3 non-profit in Owensboro, Kentucky focused on gathering, preserving, exhibiting and disseminating the artifacts, history, collection and performance art of the global history of bluegrass music through an educational experience. Formed in 1991, the IBMM is currently constructing a new building in downtown Owensboro, KY along the Ohio River. Just three blocks west of the current location, this new facility will double the museum’s exhibit space and incorporate a 450 seat theatre, an outdoor performance area, expanded research library, rooftop restaurant and much more. Bluegrass Music Centre. Owensboro KY. The City of Owensboro, Mayor Ron Payne, the Daviess County Fiscal Court and Judge Executive Al Mattingly, the International Bluegrass Music Museum and Hall of Fame is set to break ground on a new $15.4 million facility this Thursday 23rd June, at 311 West 2nd Street, Owensboro. This fully funded project is a collaboration between the City of Owensboro, the State of Kentucky and the IBMM. Not only is this a good thing for Owensboro, but the new and expanded Museum and Hall of Fame is good for the State of Kentucky. From a tourism standpoint, this is a Kentucky project – Chris Joslin, IBMM Executive Director. This $15.4 million project will allow IBMM to house the world’s foremost collection of bluegrass artifacts, memorabilia, and music recordings in a safe environment for generations to come. With views of the Ohio River, the new Bluegrass Museum and Hall of Fame will be the focal point of the city of Owensboro. It will be the only full-scale Bluegrass Music Museum in the world, including a 450 seat concert hall, recording studio, an outdoor concert area to seat 2,000, an expansive gift shop, research library, teaching rooms and a rooftop restaurant overlooking downtown. Peyronnin Construction of Evansville was awarded the construction contract to build the new Bluegrass Museum and Hall of Fame; completion is estimated to be the spring of 2018. The property comprises an entire city block at the heart of the newly revitalised downtown area, and is adjacent to the Owensboro Convention Centre, two new hotels, and the world-renowned $64 million waterfront park. Bluegrass music is a treasured art form performed in dozens of countries around the world, and the IBMM works daily to preserve this rich and vibrant history through its archival and educational programs. Owensboro Kentucky set to become the capital city of bluegrass music. Architectural plans for a new International Bluegrass Music Centre for Owensboro Kentucky are about to go to tender according to new sources we received today. The new International Bluegrass Music Centre will be a feature of an eighty million dollar waterfront park be at the very best address in Owensboro. The park will be developed on the corner of the main east-west and north-south arteries in Owensboro, on the Ohio River. The music centre will house the bluegrass museum and hall of fame, indoor and outdoor performance areas and a restaurant. The new 50,000-square-foot music centre will double the current space that the bluegrass museum now occupies. 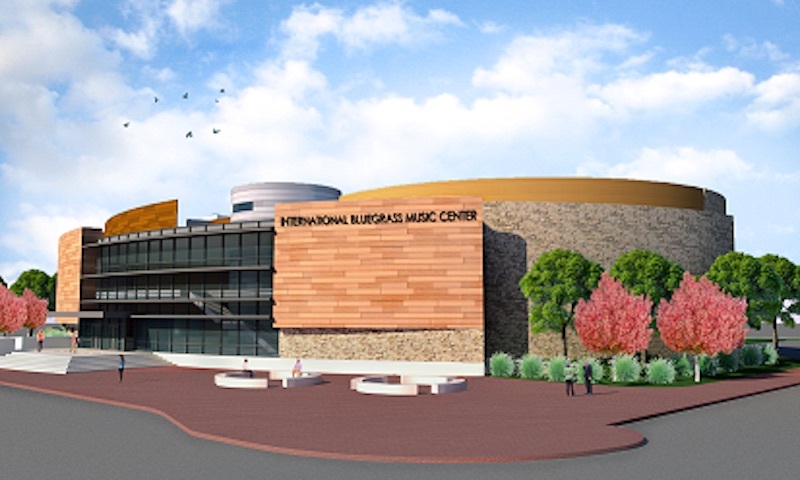 The new music centre will position Owensboro as the home for bluegrass music that will attract visitors from around the globe – Chris Joslin, Executive Director, International Bluegrass Museum. Construction on the $15.4 million dollar project is expected to begin in April and be complete in about 18 months. The new museum should be finished by 2017. This is not an Owensboro project, this is a state of Kentucky project. We’re about to take Owensboro worldwide – Owensboro Mayor Ron Payne. IBMM’s Travelling Exhibit At IBMA. The International Bluegrass Music Museum will showcase a traveling exhibition featuring several rare artifacts during the International Bluegrass Music Association’s World of Bluegrass next week in Raleigh, North Carolina. Artifacts featured will include an autographed fox horn once owned by Bill Monroe, a patent leather show worn by Mac Wiseman, and numerous artifacts from Carlton Haney’s Fincastle Festival. Attendees will have the opportunity to view clips of interviews with Carlton Haney, Larry Sparks and Bill Keith, to name a few, during a short video promoting one of the Museum’s flagship programs, the Video Oral History Project (VOHP). The VOHP began in 2002, when the Museum undertook the ambitious task of interviewing and filming first and second-generation bluegrass musicians. Since then the Museum has interviewed well over 150 musicians. Exhibit booths will be open for attendees Wednesday and Thursday from 1:00 until 5:00 pm and Friday and Saturday from 11:00 am until 6:00 pm. IBMM will be located at booth 408. 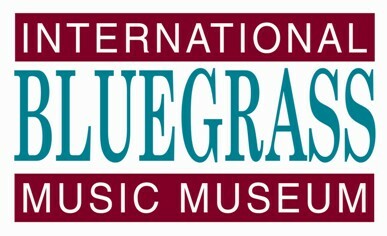 The International Bluegrass Music Museum has been announced as a recipient of the International Bluegrass Music Association’s 2015 Distinguished Achievement Award. The announcement was made during the nominee show for the 26th Annual International Bluegrass Music Awards on SiriusXM’s Bluegrass Junction channel, hosted by radio personality and Bluegrass Museum trustee, Kyle Cantrell. The Distinguished Achievement Award is second only to induction into the [IBMA] Hall of Fame – Kyle Cantrell. IBMA’s Distinguished Achievement Award program exists to honor those in bluegrass music who have proven to be forerunners in their particular field of endeavour, and/or fostered bluegrass music’s image with developments that will broaden the music’s recognition and accessibility. Also receiving the 2015 Distinguished Achievement award are Alison Brown, Murphy Henry, “Bashful Brother” Oswald Kirby, and Steve Martin. Past award winners include IBMM Vice-Chairman, Terry Woodward, Deering Banjos, Tom T. and Dixie Hall, The Grand Ole Opry, Martin Guitars, Keith Case, Fred Bartenstein and many other distinguished Bluegrass music names. Staff and trustees of the Museum will accept the award during IBMA’s World of Bluegrass in Raleigh, NC on October 1.